This digital image is one from a collection of film and digital photographs, and ink drawings, made whilst involved in a 'Secret Gardens' assignment with other Network Artists in Northumberland members some years ago. All work was based on Chesters Walled Garden, near Hexham, and The Garden Station at Langley, both in Northumberland. 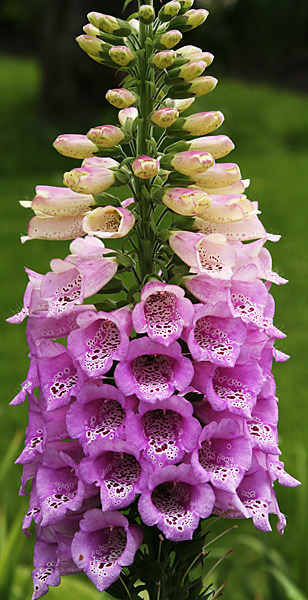 'Foxglove' is the popular name for the 'Digitalus' genus. The common foxglove is biennial and native to Europe, northwest Africa and west-central Asia. Although the whole plant is toxic, it yields a range of substances used for medicinal purposes. In nature or the garden, the drifts of tall flower spikes enhance the landscape. In addition to the documentary photographs and drawings for 'Secret Gardens', I wanted to explore the possibilities of manipulating shape, pattern, colour, etc to create a third image series to which this image, 04, 07, 08, and 18 belong. A similar approach was used elsewhere in some of the 'Abstract' galleries. 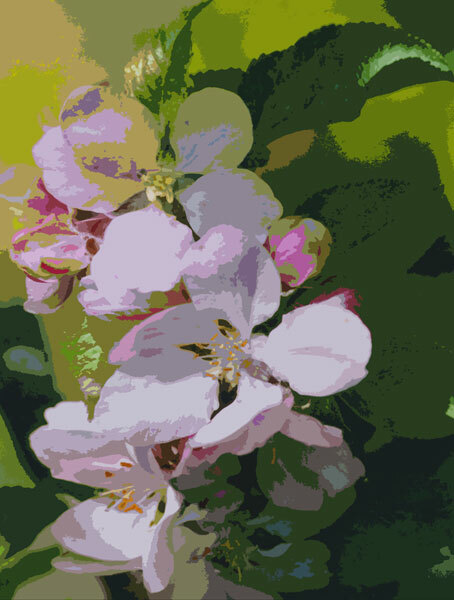 A photograph of a small stem of cordon apple blossom in Chesters Walled Garden provided the starting point for the intuitive evolution of this image. Past involvement with abstract painting and ceramic forms is the basis for this approach, particularly in the 'Abstraction' galleries where the starting point is often architectural photography. Massed peonies are a spectacular contribution to an herbaceous border. Individual flowers range from those with very few simply shaped petals with open centres to large spherical heads of many irregularly edged petals. The softness of detail is perhaps a negative aspect of my aversion to carrying a tripod. Backlighting to vegetation introduces shadow shapes to add to those evident in a more general light. 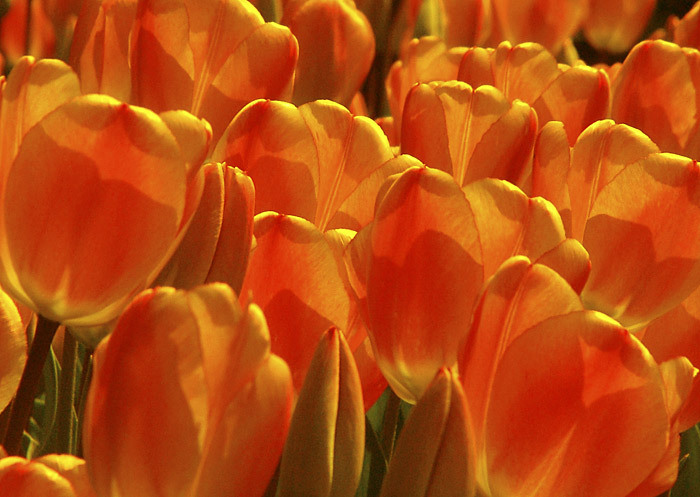 It was this and the glow imparted by the slanting sunlight that attracted me to this bed of tulips. The film-based photographs for 'Secret Gardens' were intended solely as reference material as I had intended to work in painting and drawing. 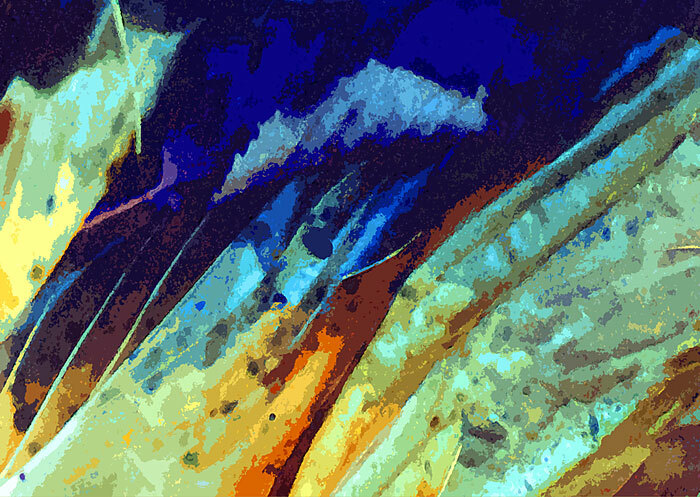 This hosta image from The Garden Station was scanned from a 6" X 4" print that presented some strange colour quirks, particularly in dark blue shadow areas. 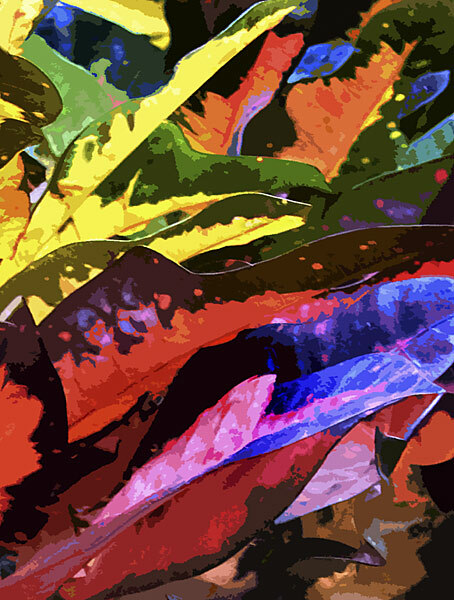 The colour enhanced leaves of a codiaeum could have emerged as a painting but became a digital image and paper based print instead. In its native south-east Asia habitat it can grow to several metres in height but in Britain it is usually a more modestly scaled pot plant. Its leaves can vary considerably in shape, colour and pattern across some sixteen species. 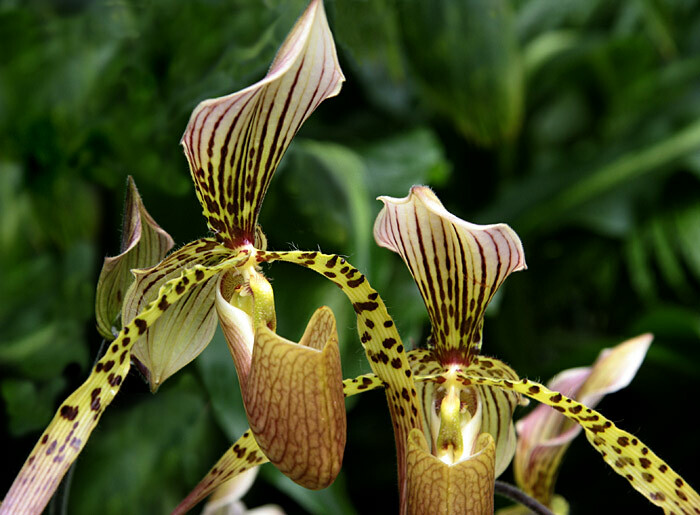 The orchid is the largest family of flowering plants, with over 20,000 recognised species within the Orchidaceae genus. 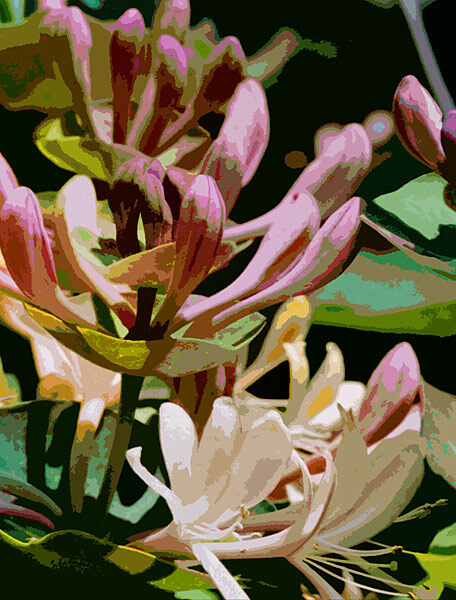 It is most varied and prolific in tropical regions where elaborate forms and varied colourings are common. 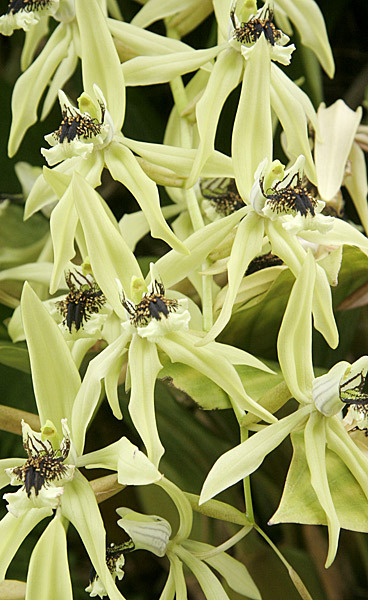 Most orchids growing in tropical regions are epiphytic, growing, but not parasitic, upon trees and shrubs; in temperate lands, habitats are usually terrestrial. The Early Purple Orchid is the most common species in the British Isles, growing in meadows, pastures and woodlands. 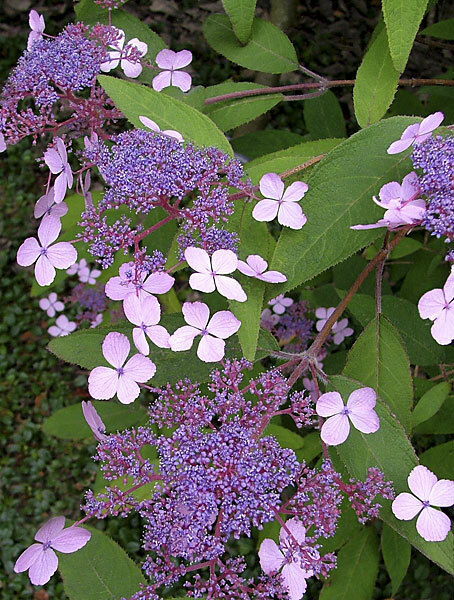 Its flower stem carries a spike of up to thirty, small, red-purple flowers.
. Hydrangea is a diverse genus incorporating tree, shrub and climbing habits and a range of flower forms in white and colours and native to southern and eastern Asia but particularly to China. 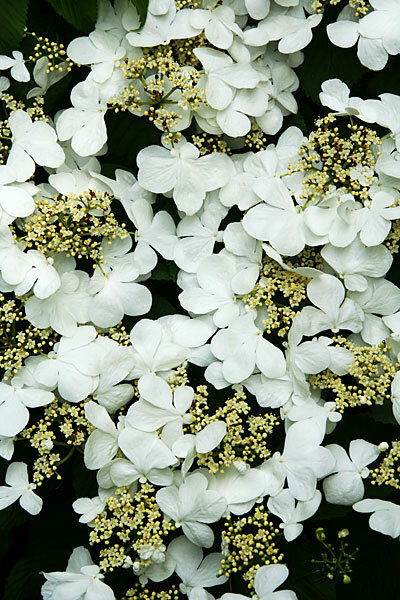 Here, hazy light softens the brilliant whites and yellows in a lacework of flowers. Hydrangea aspera is one of some seventy species and is characterised by the blue and violet tones of its unusually formed flowers. I liked the contrast established with the soft green of the narrow leaves. 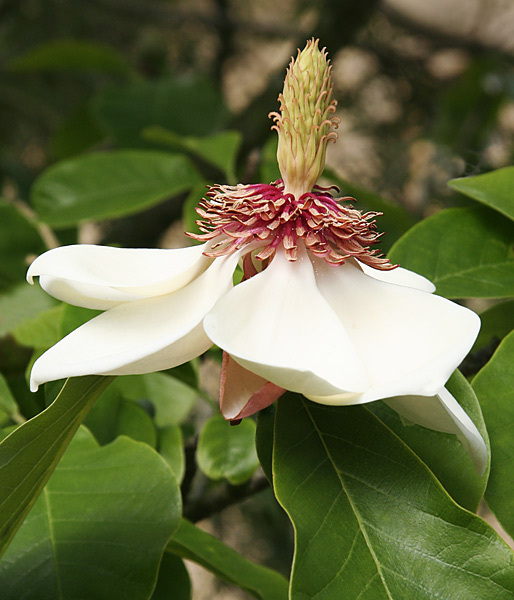 The magnolia is native particularly to east and south-east Asia and also to North, Central and South America. It is an ancient genus dating from the cretaceous period and which has evolved some 200 species. Its robust structure relates to early pollination by insects that pre-date the appearance of bees. In 1703 Charles Plumier, Royal Botanist to King Louis X1V, landed on the French colonial island of Martinique during a scientific expedition. 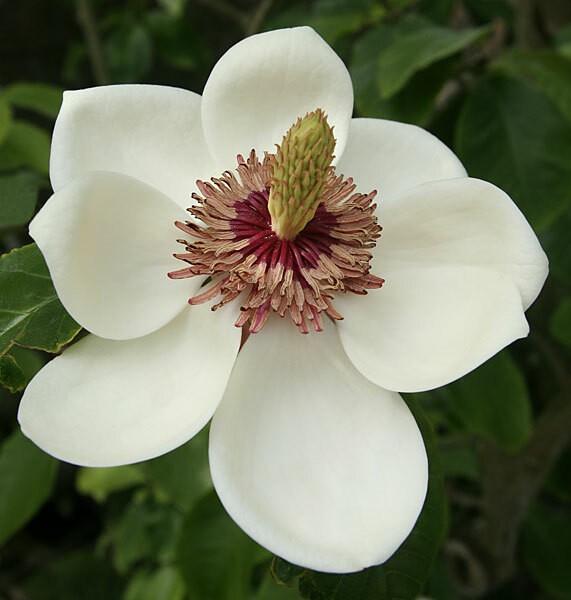 There he named the magnolia tree after his eminent botanic contemporary, Pierre Magnol. 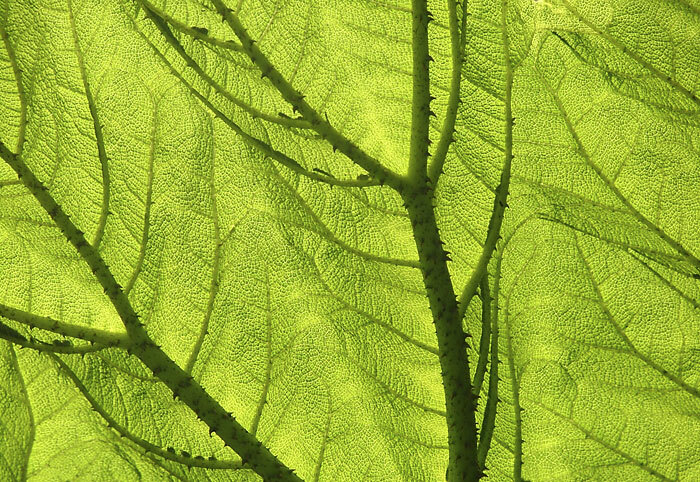 The sinuous undulating lines of ribs and leaf edges and the wide light range prompted this image. 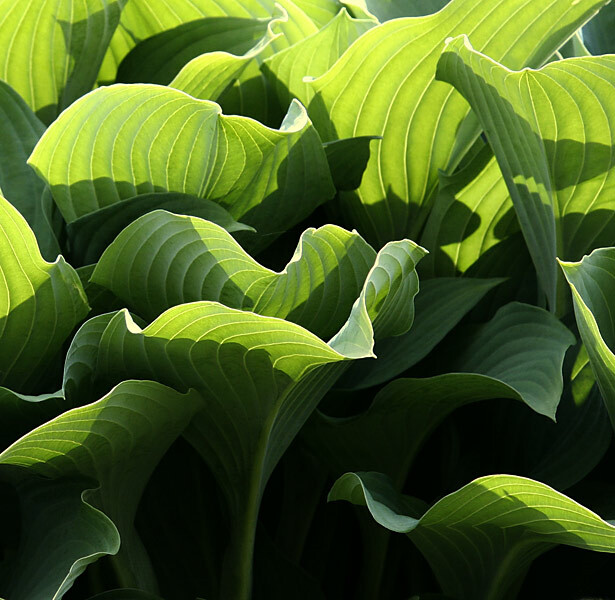 The hosta, or plantain lily, is named after the Austrian botanist Nicholas Host and is native mainly to China, Japan and Korea. Scientific explorers brought specimens of this largely shade loving plant back to Europe at the end of the eighteenth century. This is a plant on an architectural scale, with expansive and serrated leaves raised sufficiently high on thick spiny stems to provide shelter. Its popular name is 'giant rhubarb' and, like its domestic namesake, grows afresh each year from a central crown, forming green conical flowers on tall, hollow, stalks. Native to Brazil and Colombia, it grows best in damp bog conditions. 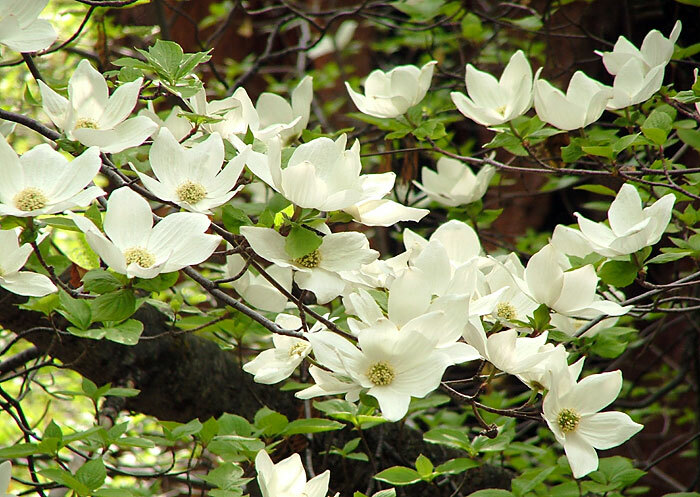 This is one of some forty species of dogwood tree and was photographed in the Sequoia National Park in California. Its flowers measure several inches across and appear in spring and early summer. 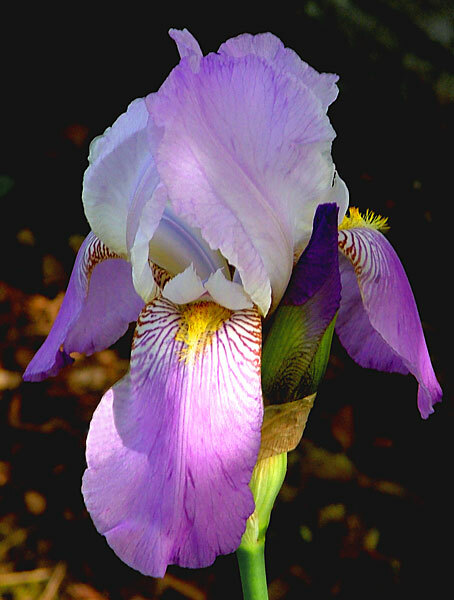 The flowers can take a different form in other species. 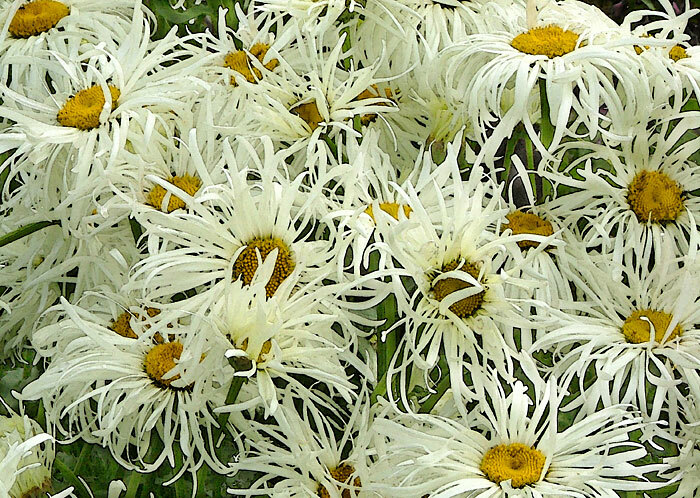 The original photograph recorded flowers on a tall clumped herbaceous perennial daisy to which I hesitate to ascribe a more accurate name. 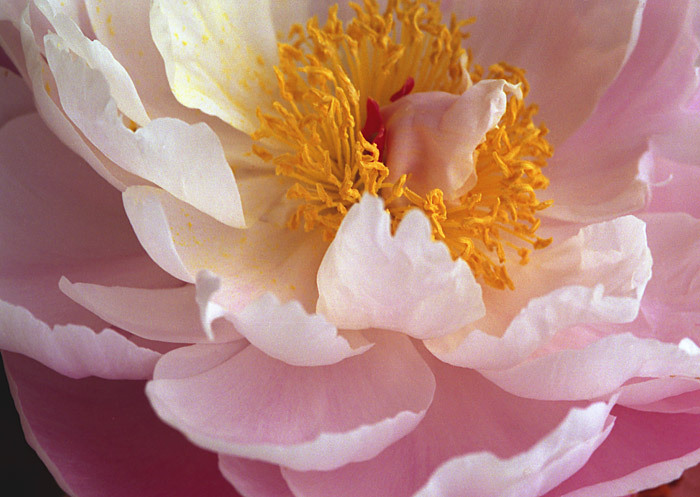 However, this image is a more sensual response to the windblown tousle of petals surrounding their spiralled centres under a bright summer sun.